Escape London opened their first branch in the capital back in mid-2016, and we played the three games there not long after. Fast forward eighteen months and they’ve opened a second branch. This time they’ve headed for the opposite corner of zone 2, up in Shadwell just north of the City. I was curious to see how they’d progressed over that intervening period. There are three games up in this part of London: Taken, Anarchy of the Seven Seas and the one we were about to play, Witchcraft and Wizardry. As luck would have it, I’ve been to two other Escape venues that host this game since we played here (one of which I played in full with my children), and something I find very interesting about their model is that each room has its own character. While the basic theme might be the same, the decoration is very much unique to the venue and – more surprisingly – so are the puzzles. I suspect there’s more overlap between most of their games but, to take Colchester as an example, only one puzzle across the two rooms was shared. It’s nice to think that even if the Escape brand are churning out more game sites than any other location, they’re not just mass-produced. Welcome to the school of witchcraft and wizardry where there has been some funny goings on. In a classroom full of tricks, puzzles, challenges and spells, you must solve them all to escape the grasps of the evil professor and graduate with a distinction! Having played four games of theirs around the country before this one, there was one thing that I could confidently say about the brand: their rooms tend to be pretty bare. Not here! This one was far better decorated and, although one or two props looked a little cheap, the vast majority of the room sold me on the theming. And what was the theming? Well, there’s been a lot of discussion of Harry-Potter-influenced rooms on the enthusiast forums recently, so here’s my take: if you’d slapped a Harry Potter label on the room, I don’t think anyone would have particularly complained. It ticks a lot of boxes that you’d require of such a room, although it’s obviously missing the Harry Potter branding itself. 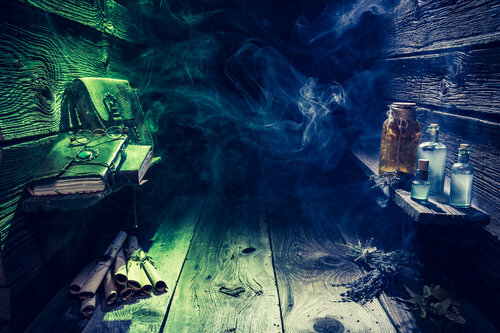 There’s suitably ethereal music (with the celeste sound and unusual chords), plenty of magic-related paraphernalia (brooms, wands, potions) and old-fashioned school theming (four houses, cloaks). They’re clearly taking advantage of the Harry Potter “craze” (can you still call it that after two decades? ), but really the only thing I felt was a little too close for comfort was the not-quite-Harry-Potter music, and I can’t imagine they’d composed that themselves. In the end, “school of magic” is hardly a Harry Potter concept, and most of the items I’ve mentioned are natural inclusions in such a game. Whether you feel it’s over the mark is probably a personal decision, but there are certainly worse offenders in the UK, and even those are nowhere close to what you might find in Eastern Europe. Your mission in the game is supposedly to escape the classroom and gain a distinction, but the puzzles in the room have nothing to do with that mission. It’s a room filled with individual puzzles and, while they are magic themed, I didn’t feel like we were actually working towards that final goal. I think they missed a trick there. Instead of just having arbitrary puzzles, they could have created game involving a series of challenges to overcome. Perhaps collecting the ingredients for a spell, or mastering the different aspects of wizardry. In fact, the game itself feels almost like it’s got that structure – it’s fairly parallelised and there’s scope for an enthusiast team really blitzing through it. The puzzles had some high points that felt a little bit like creating magic, but there was a preponderance of what I’d describe as old-school puzzle mechanics such as counting, observation and even a small logic puzzle at one point. None of it really made us think very hard. In fact, the hardest periods of thinking were due to a couple of mechanisms being a littler pernickety. In both cases we’d correctly solved the puzzle but our inputting of the answer was just subtly different from what the technology was expecting. On one occasion we were a millimetre away from the right place, on the other a fraction of a second off with our timing. On both occasions that led to some frustration in feeling that we’d found a good answer which didn’t work and then wasting our time trying a series of answers that didn’t seem right. When we finally retried our original solution, we didn’t get the same surge of satisfaction that we would have done had it worked first time. What was nice about the tech was that it felt like it fitted rather than being shoehorned into the game. I counted at least four different ways it had been used but I had to think pretty carefully to remember them, which is a sign that tech didn’t become the dominant factor. I enjoyed the simple finish to this game, which was on theme and was something that everyone would see happening. Just a shame they couldn’t have involved more of the players in it. We escaped in under 35 minutes without taking a clue. Had we needed them, they would have been delivered over a screen. This is a pretty room with a reasonable and nicely structured set of puzzles. Although it could most definitely be improved, we enjoyed our time in the game and, as London games go, it would sneak into my top half. We played this as a group of four, which worked out OK and would be a good number for beginners. For enthusiasts, go along as a pair – there’s enough to do, it’s fun to be in and it’s logical enough that you should still have enough time to escape.